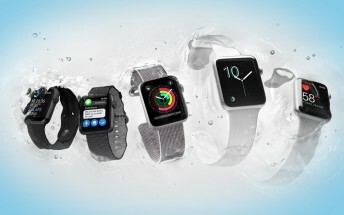 The wearable market is growing slowly but its dynamics are changing. According to Strategy Analytics, Apple ousted Fitbit from the top position with 3.5 million wearables shipped during the first quarter of this year. That’s a jump of 59% compared to the same period last year. Apple raced ahead of the market, which grew only 21% annually for a total of 22 million units shipped. Fitbit went from first (with 4.5 million in Q1 2016) to third (with just 2.9 million in Q1 2017), a massive slump. Xiaomi also declined - from 3.8 million to 3.5 million - but it still kept enough market share (15%) to go up to second place. The market also diversified, makers outside the Top 3 went up from 7.7 million units to 12.2 million. Growth mostly came from North America, Europe and Asia. The Apple Watch 2 in particular was a hot seller in the US, UK and several other countries, helped out by strong marketing. This is a good place to mention that Xiaomi mostly ships smart bands, Fitbit has a variety of fitness trackers and smartwatches (though not Android Wear) while Apple only ships full-blown smartwatches. So numbers are not always directly comparable. Still, the main takeaway from this is that the once market leader, Fitbit, is now in trouble. Shipments, along with revenue and profits, have fallen and it will be a struggle to recover.